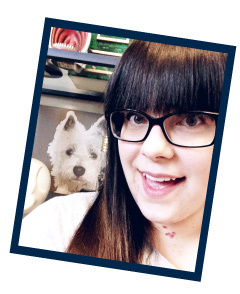 Today's mood board was created for my best friend Amber. Amber is in the process of converting her guestroom into a playroom for her two sons, Rocklyn and Ryder and came to me for some advice on how to create a room that would serve multiple functions including creating, playing and learning. 1. Amber wanted to create a stage area for her boys so I thought that including some track lighting with adjustable spotlights would be perfect for illuminating center stage. 2. Rocklyn and Ryder's playroom is going to function as a learning environment and this globe would serve as a great decoration for now and as a learning tool for when they get older. 3 and 4. This beautiful giclée print would add a lot of color to the room and would look great framed in the clean-lined Ribba frame from IKEA. 5. Another piece of IKEA's Ribba line is this simple picture ledge that can be used to hold a variety of items including children's books, toys or framed drawings that the boys create as they get older. 6 and 7. To create the stage area Amber was looking for, I paired two of IKEA's Stuva storage systems together (left side with attached bench and right side). The top of the bench completes the stage area and the doors and drawers on either side provide plenty of storage for costumes and toys. 8. The Kritter table from IKEA is the perfect spot for the boys to work on their letters or coloring skills and would also function as a space for them to complete their homework when they start school in a few years. 9. The Kritter chair from IKEA comes in a variety of colors but I chose red to give the room a punch of color. 10. CB2's knitted pouf is the perfect spot for Amber or her husband Cory to sit down on and read to the boys and/or help them with their homework. The pouf is very soft but sturdier than a beanbag and I bet Rocklyn and Ryder would have a lot of fun climbing all over it! 11. The striped side by side tiles from FLOR would be perfect for the playroom since each tile can be picked up, washed off and be put back into place so there's no need to worry if some juice is spilled or if a painting spree goes wrong! 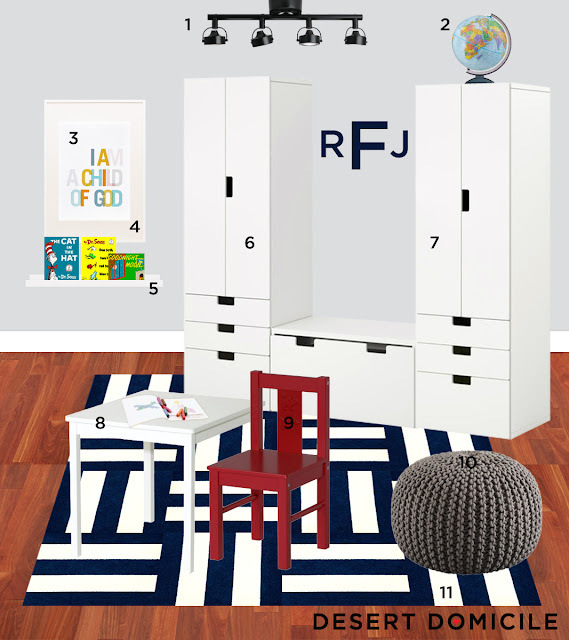 The mood board looks great and creates a great base for the playroom. Children tend to thrive in environments that allow them to add their own personal touch and where they don't feel restricted. Adding an interactive element such as a 'chalk paint wall' or climbing rack, areas for 'construction' (lego, blocks, mechano etc) and a comfy area to wind down and relax. Thought poufs are great, bean bags tend to work better in the long run. Not only are the covers removable (and thereby washable or exchangable) but they also allow for little bodies to 'flop'. Good luck with it all and do keep us posted on the progress. THANKS SO MUCH! love it. esp the stage and track lighting. may put different colored bulbs in there to make it more spotlight like! time to get started! Really cool! Those little guys are going to get one stylish space!